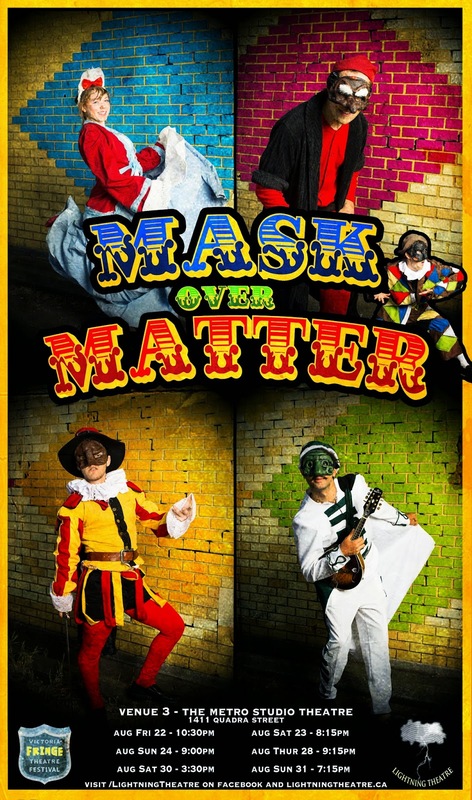 Mask over Matter is one of those plays with a name that conjures forth visages of wonderment and intrigue. Instead, the show offers a mix of pantomime and improv where the performers are wearing a mask in order to play archetypical characters from many a narrative. In what they represent are not necessarily that of comedy and tragedy that Greek theatre made famous. The style hails from Italy where it’s more commonly known as Commedia dell’arte. Deception is used to create its humour, and it’s a different type of improv that many may not be familiar with, much less get. At least for this young comedy group, they are certainly learning the ropes fast. With a few members of the cast schooled by the Dave Morris’ Improv Class, at least they are being trained by the best. Andrew Brimmell and Shahin Mohamadi are two such individuals. Together, with Daniel Belkin, Robin Valerie and Kevin Koch, they play a diverse cast of characters from various social standings. They are caricatures of various occupations and a night’s show can be a discourse in social studies. As with many a performance, Brighella (Shahin Mohamadi) Arlecchino (Kevin Koch) and Columbina (Robin Valerie) introduce what this type of comedy is about and audiences are essentially being taken for a ride of slapstick after a few audience members provide a few ideas and direction to help move the night’s performance along. When the concepts offered are strong, then the show will plod along quite well. When it’s not, what’s seen may well be a struggle by the performers to keep the night’s entertainment at least merry. This new group certainly shows promise in playing the archetypes they represent, like that of the Bumbling Oaf (Il Dottore / The Doctor) or The Braggart (Il Capitano / The Captain). Another character includes the sexually repressed Old Miser (Pantalone, Andrew Brimmell). No matter what the night this play is seen, this particular persona steals the show. Perhaps what this troupe offered was more like surreal comedy than anything traditional. In order to fully understand their work will require a crash course in absurdism. Until their next show, maybe watching Monty Python is the best way to prep for what this comedy troupe has in store. This entry was posted in Reviews, Theatre, Uncategorized and tagged Andrew Brimmell, Dave Morris, Kevin Koch, Lightning Theatre, Mask Over Matter, Robin Valerie, Shahin Mohamadi, Victoria Fringe Festival. Bookmark the permalink.